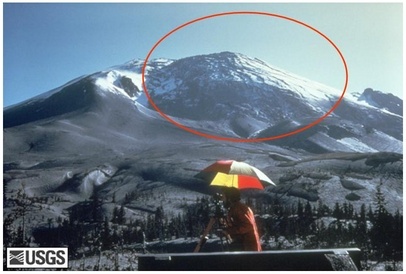 Before March 1980, there was only one way to tell that Mount St. Helens was a volcano. Its glacier-covered conical shape resembled those of other famous fire mountains, like Shasta, Mt. Rainier or Fujiyama. But in the early spring three decades ago, Mount St. Helens began to rumble. Seismologists registered an ever increasing number of small earthquakes, fumaroles began to vent, and minor eruptions shot ash and steam out of its crater. The most ominous sign that something big was brewing under the mountain developed on its north side. Within four weeks, this flank bulged out with hitherto unknown speed (see Figure 1). Like rapidly rising bread dough, the north slope of Mount St. Helens grew and grew, sometimes by ten feet a day. Then, on May 18 at 8:32 a.m. an earthquake of magnitude 5.1 rattled the mountain (see Figure 2). What would have had only minor consequences under normal circumstances led to a chain of events in which 57 people died and thousands of square miles of pristine land ended up devastated. The quake occurred about a mile under the volcano and its rattling was strong enough to shake loose the unstable bulge on the volcano's north side. The bulge began to collapse and slip down the mountain, thereby producing the largest historically recorded landslide-debris avalanche. Almost one cubic mile of rocks raced down the flank with speeds of up to 150 miles per hour, devastating everything in a 24 square mile area north of the volcano. But it got even worse. 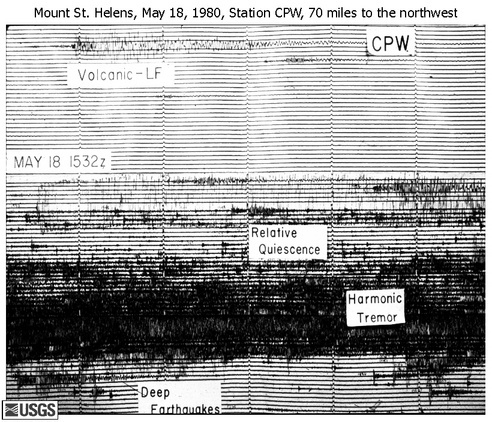 Until the bulge began to slide, its weight had kept the magma under Mount St. Helens at bay. However, once this lid was off, the pressurized magma violently made its way to the surface, thereby blowing away the summit of Mount St. Helens. The rest is history: The mountain is now 1300 feet shorter than it was before the blast, and 540 million tons of volcanic ash covered a 22,000 square mile area in eleven states.